My most recent water research turned up an amazing fact: In 1869 there was an established creek that popped up out of a sand dune and then disappeared back into it—near Masonic Ave! 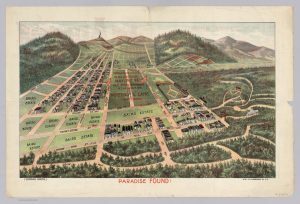 This 1893 real estate drawing shows the Panhandle in the fore and Cole Valley behind (looking South). The source of that creek was Cole Valley and its upper slopes. The mouth was at Folsom Street, where Rainbow Grocery is today. Twice in that long run it soaked in and reëmerged. We’ll examine evidence and also the landscape to understand how things have changed and how the sandy ground is infused with groundwater flows. We’ll check the 1869 map that marks a creek and also the first good survey published of the Panhandle, by William Hammond Hall, that indicates hills where it’s now all flat. Topics: Dune hydrology, bedrock springs, reservoirs, extreme weather, old maps & pictures. ↪ No hills! Lots of standing discussion, so you may get chilled if you forget your extra layers. It may be windy.